Panay is an island and a group of islands in the Western Visayas. Panay lays in the administrative region VI and is composed of 4 provinces: Aklan, Antique, Iloilo and Capiz. The western part of Panay is dominated by a high rising chain of mountains. The center consists of lowlands and the east side in Capiz province is composed of smooth hills. Panay is a non-volcanic island. If you are interested in geology, click here. 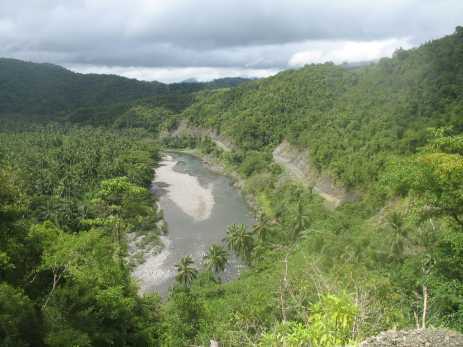 The most important rivers are the Madalag/Aklan river system and the Ibajai river, both are in Aklan province in the north. 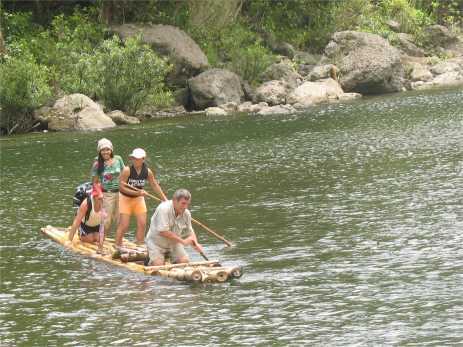 An interesting discovery trip might be the slowly winding Jalaur river in Iloilo province. Beaches can be found all around the island of Panay. 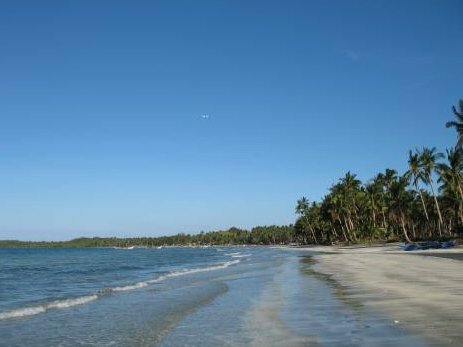 The most beautiful ones are Jawili Beach in Aklan, Mararison and Phaidon beach in Antique, the beaches east of Iloilo City and the famous beaches of Boracay island. 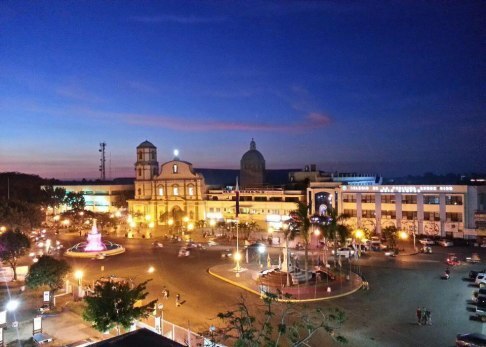 Cultural capital of Panay is Iloilo City with its many Spanish relicts. In our honest opinion Roxas is the culinary capital of the island. The most colorful festivals can be experienced in Kalibo, Makato and Ibajai. 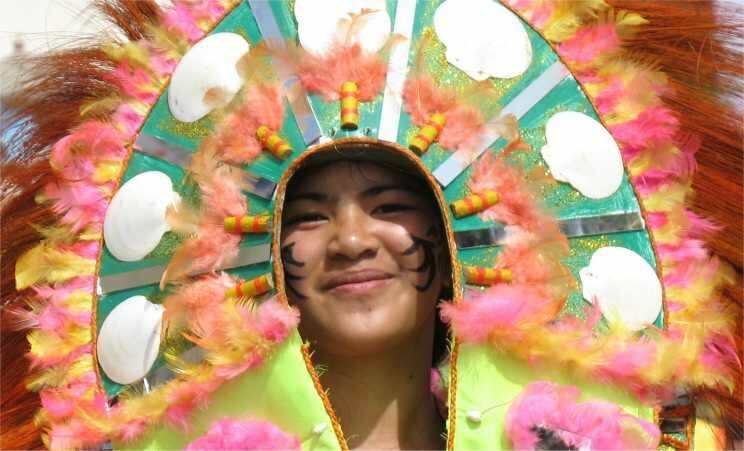 This are the Ati-Atihan festivals in 3rd week of January. You may zoom in and out and change the type of map between street, terrain and satellite view. If you have a big scrren, you may enlarge to full screen. 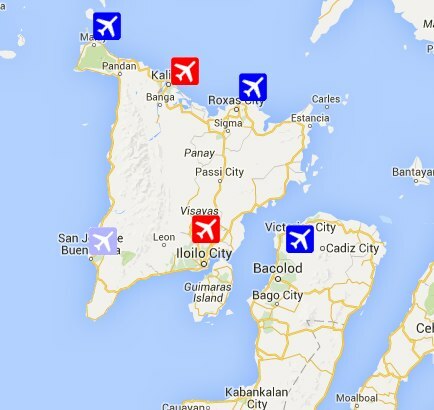 Panay has 4 airports. 2 of them are international (Kalibo and Iloilo) and 2 of them are domestic (Caticlan and Roxas). The most busy airport is Kalibo. It serves as a secondary gateway to Boracay. The island has 3 ferry ports (Caticlan, Dumaguit and Iloilo). There are good roads linking all interesting spots on the island. 24 hours bus services exist between Caticlan - Kalibo - Iloilo. You may also avail of van and limousine services. Taxis only exist in Iloilo. Between towns and cities you may want to ride for a few pesos with a jeepney. In and around towns and in remote places you are transported by tricycles. Between Panay and the surrounding islands you can take a regular outrigger boat (bangka) or hire one for your own private party. Click here to see the interactive map and more airport information. Click here to see the interactive map and more port information. Panay has a diverse climate. The western half of Aklan, Iloilo and western tip of Capiz is characterized by two pronounced seasons: dry season from November to April and wet season during the rest of the year. 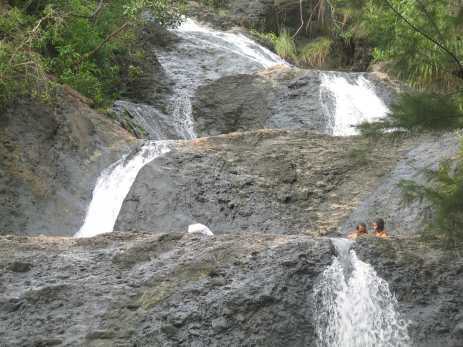 In other areas of the island, the climate is characterized by seasons where maximum rain period are not pronounced and the dry season last only from one to three months. Rainfall patterns show a peak rainfall during month of September and lowest on March to April. 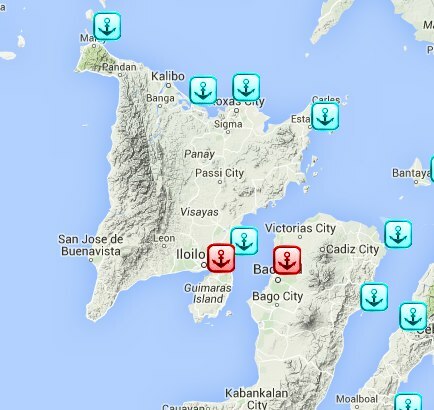 Here you find more information about the 4 climates in the Philippines. The Philippine's tourist spot #1 is Boracay. 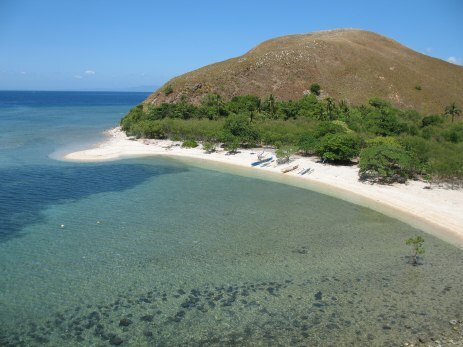 This small island in the north of Panay is only accessible from Panay's port of Caticlan. Tourism on the main island is concentrated around Iloilo City, the north of Aklan (Jawili) and the beaches and springs of Pandan (Antique). 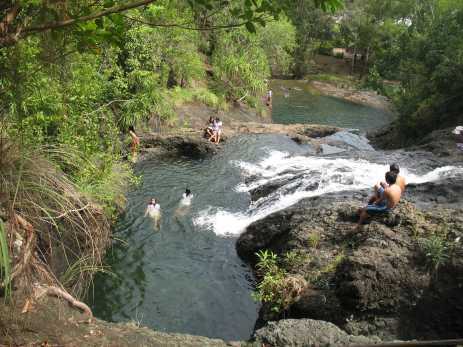 Panay tourism is for those who are looking for secret coves and empty beaches, waterfalls and freshwater springs. In all these places one finds good to excellent resorts. Really good restaurants are very sparse. More information in the section below. The productive agricultural land area in Panay totaled to 4,566.88 km2 and the rest is grassland, woodland, wetland and mountains. The island produces muscovado, coconut, banana, fruits, root crops and vegetables. Panay is being considered as the second largest rice producing region in the Philippines. Panay has a long stretch coastline that covers 52 municipalities and barangays. An important diversity of marine life in terms of fish species, coral reefs and mangrove areas can be found around the island. For inland fishery, a vast resource includes of 881 rivers, 27 lakes and 42 lagoons which are available for direct fishing and recreational purposes. A large scale government program restores the damaged coral reefs (dynamite and cyanid fishing). First results can be seen off the cost of Aklan. Jawili beach and falls are on the way from Kalibo to Caticlan. Leave the Aklan West Road in Tangalan and follow the signs to Jawili. Distance from the highway is about 8 km. The Jawili Falls in Brgy. Jawili, Tarngalan are composed of 7 bassins. They invite to jump in the clear and fresh water. There is now also an associated resort with a carenderia. Jawili beach is about 4 kilometers long. It is composed of fine grey sand. Its slope falls extremely slowly. You may walk out in the water for about a hundred meters. You may also want to walk along the beach from the magrove swamp near Afga point to the norther end at the Jawili Starfish Resort. The Jawili Starfish Resort has a dive base, but we're not sure whether they still operate at this moment (09/23/2015). If your journey continues to Caticlan/Boracay, you want to follow the now concreted Tangalan-Ibajai Road. This is faster and much more scenic than driving back to Tangalan. Should your way lead back to Kalibo, you may also visit Afga point with its lighthouse and very small beach. 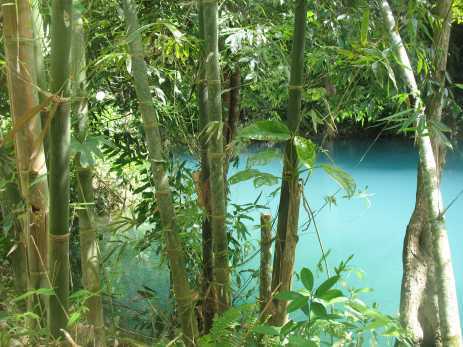 The Malumpati Springs are known for their cristal clear water. They are also known to be one of the largest vertical springs in the world. The pond has a diameter of 30 meters. The depth is not yet known because divers who explored the pond could not get deeper than 40 meters. There the water pressure became too strong. The micro-climate around the springs and the rocky soil are favourable for the development of a rainforest. When you come on the Aklan West Road (Kalibo to Caticlan) then follow the Iloilo-Antique Road in dirction Pandan. At GPS point Lat: 11.777431°, Long: 122.097123° turn right. Follow the rough road for about 3.5 kilometers. If you are already near or in Pandan, then go to barangay Mag Aba and follow the 4 km raugh road to Malumpati Springs. First thing you will see is the rest area around the pools. Everyday you find families spending their pasttime there. Cross over the stonebridge and continue past the pump-station. You will be in a tropical forest - not yet the rainforest. 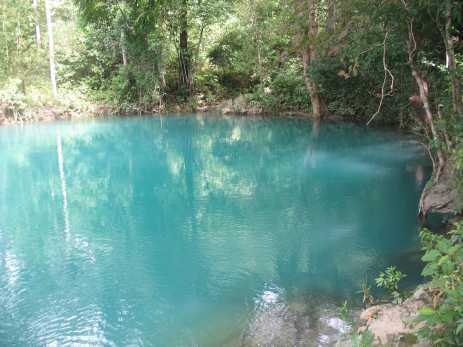 After another 15 minutes of walk along the river, you will discover the Malumpati Spring bassin. Go around it, because in its most remote part, there is another spring and there is the rainforest. Sit down. There are lots of animals and plants around you. Return to the rest area on the other shore of the river. At the rest area you find BBQ places and covered sheds. A sari-sari store provides food and beverage. 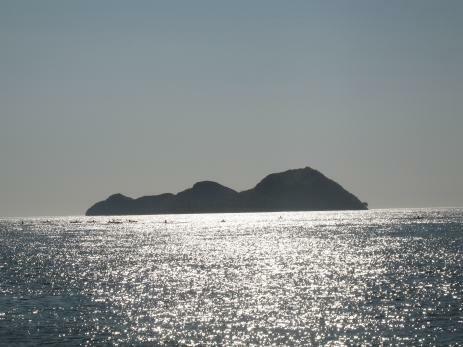 Mararison Island, also called Malalison, the "Island of the Sleeping Lady", lies about 1.5 miles off the shore of Culasi (Antique). Mararison is a small island with a few fisher huts and small rice fields inland. You can buy nothing there. Therefore bring your own lunchpack with you. From Kalibo it is a short ride of about 1h30 to Culasi. You can also get to Culasi by bus (Ceres Liner) or by Jeepney. There you will have to negotiate a fisherboat that takes you to Mararison and back. A reasonable price lays between PHP 1,000 and 2,000, depending on the size of the boat. Think of some 30 minutes to cross the sea between Panay and Mararison. Ask the skipper to drop you off at the beach of your choice. Recently Katahum Tours started an all inclusive project. From June to October it is recommended to first read the seaweather forecast. A strong Habagat, southwest monsoon can make it impossible to reach the island. Mararison has 5 beaches. Four of them are white sandy beaches. We prefer Luyo beach in the west. The fifth beach, Gui-ob beach is made of pebbles. This beach is recommended for snorkelers and divers. Just off the beach are under water canyons going from 2 meters down to about 15 meters. We strongly recommend a little hike either inland or up the steep coastal hills. The inland of this small island is cultivated with rice fields. You may also see carnivorous pitcher plants. It seems that recently tourism has developed exponentially and that the Nablag cave near Gui-ob beach has been victime of vandales painting graffities everywhere. Geographically, Madalag is situated in the central part of Aklan province, bordered on the east by Balete, on the west by Antique, on the north by Malinao and Banga, and on the south by Libacao. It is 190 kilometers away from the regional capital, Iloilo City, and approximately 33 kilometers from the capital of Aklan, Kalibo. From Kalibo, take a jeepney bound for Libacao and get off at Madalag. Travel time can take up to one and a half hours. Best months to visit the Madalag river valley are from March thru June. If the White Rocks in Liktinon are your destination, then you may also go up to Maria Cristina by motorbike (habal-habal). The ride costs approx. PHP 100. In one day you may go up to Maria Cristina and come back by raft. In Maria Cristina you find a sari-sari store with drinks and snacks. If you want to go up to Sitio Liktinon White Rocks and the Daeayap Falls, you should add another hour upstream. In this case we recommend a two days trip. You may sleep at a family in Maria Cristina. For more information and assistance, contact municipal tourism officer Francisco "Escot" Intela at +63 921 488-5954. Lezo: When in Kalibo, take a jeepney to the village of Lezo. 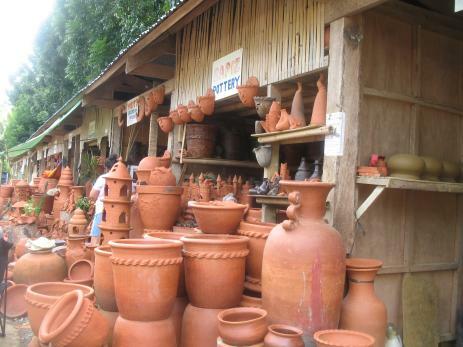 Lezo is an OTOP village (One Town One Product) that produces clay potery. A lot of their products range from small statues to large jugs or jars. The statues range from small trinkets that you can hang in a keychain to big full sized ones depicting anything from gnomes and dwarves to fantasy beings and even religious statues. If you wanted to build your own version of the Chinese terra cotta army they can most likely do it here. 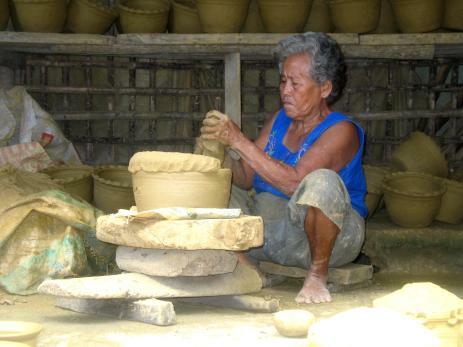 The secret is in the quality of the clay that they use and the loving care they put into making each and every piece. The raw material is taken directly from the riverbanks and brought to the site as needed. Anything that can mar the beauty of any work is taken out of the clay. This includes stones, twigs and other foreign objects. Ati Atihan: When you are on Panay island in the 3rd week of January then absolutely do not miss the Ati Atihan festival. This festival is mainly celebrated in Kalibo, Makato and Ibajay. A 13th century (c.1212 AD) event explains the origins of the festival. A small group of Malay datus, fleeing Borneo, were sold some land by the Ati people, the original inhabitants of Panay Island. The new arrivals celebrated the event at a great feast by painting themselves black to look like them. The Ati are still distinguishable today by their dark skin and curly hair, and the name "Ati-Atihan" translates as "To be like an Ati". It is considered to be "The Mother of all Philippine Festivals" which was eventually copied by other similar celebrations across the Philippines. Seafood in Roxas: When driving from Kalibo to Iloilo, take the longer road by Roxas. 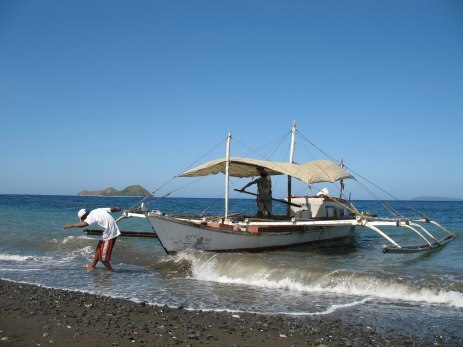 The abundance of marine life makes Roxas City the "Seafood Capital of the Philippines." Capiz is also full of caves. Explore the massive chambers of Quipot Cave. You’ll also find wild ducks, birds and deer in the area. Suhot Cave is known for its crystal clear water gushing from a spring. Because of its length, it is believed to be connected to Badian Cave in the neighboring town of Dumarao. Suhotan Cave has a cathedral-like dome and multi-layered chambers with drapers, stalactites, and a massive stalagmite. Igang Cave is another well-known limestone cave in Maayon, with chambers filled with dramatic stalactites and stalagmites. Piña: Piña cloth, also known as the Queen of Philippine Fabrics, is taken from the leaves of the pineapple plant ananas comosos. THe pineapple fibers are extracted, washed, dried, split into single strands, and knotted before being woven into a sheer, goassamer-like fabric. It is the most preferred material for wedding and special occasion gowns because of its sheerness, coolness and suitability to embroidery. Nito: Nito is a rod-like, hard, tropical vine of the fern family, with a naturally glossy skin impervious to liquids. As the material ages, it takes on a rich brown color, a natural characteristic whether woven or in its original form. 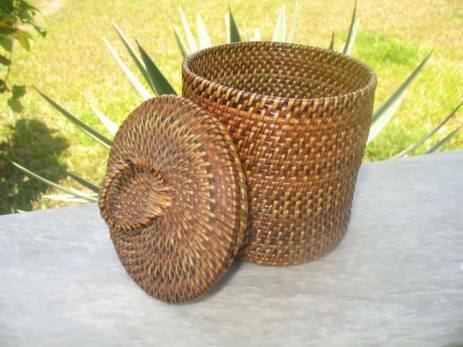 These intricately hand woven baskets have a very fine and closely-knitted weave, a result of the weavers’ expertise in hand control and careful attention to good craftsmanship. 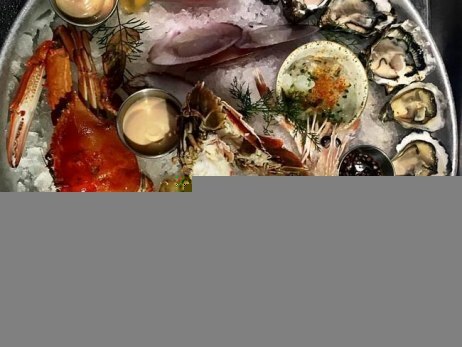 Roxas, Capiz beeing the seafood capital of the Philippines invites you to fish, crab, lobster, shellfish and more. You can eat good quality in many eateries on the shore in the port. If you like a bit style, we can recommend Espacio Verde a bit outside of the centre. When it comes to Iloilo we hesitate between La Paz Batchoy and Pancit Molo. Both Iloilo food flagships depend extremely on the quality of all the ingredients. Try these dishes at Netong's Original Special La Paz Batchoy Restaurant. But you may also stoll in the old La Paz public market and enjoy the special ambience of an eatery. If you know another good and typical restaurant on Panay island, please use the form at the end of this page to inform us. Salamat po. Click on the markers for more information. You may zoom in and out this map. If you have a big screen, you may enlarge to full screen. 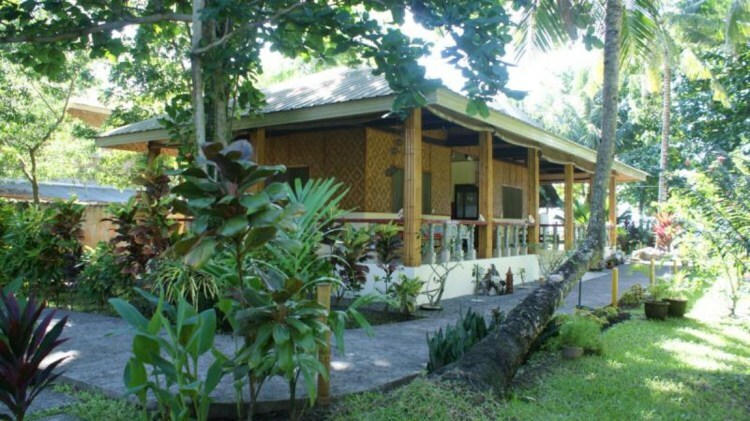 Good hotels on Panay island aren't easy to find. If you use one of these booking sites, you automatically get hotel offers from Boracay. If you need a hotel on Panay island, then you have to indicate the name of the city or town. Another negative influence of Boracay is that most tourists are just "passing thru". There are no five star hotels on Panay. Even four stars can only be given with a lot of goodwill. We therefore have marked 4 hotels and resorts that have acceptable rooms and service. There had been good hotels and resorts but either they were in the wrong place or the owners gave up. We remember the famous Jawili Blue Starfish. This Hotel/Resort had really been nice. 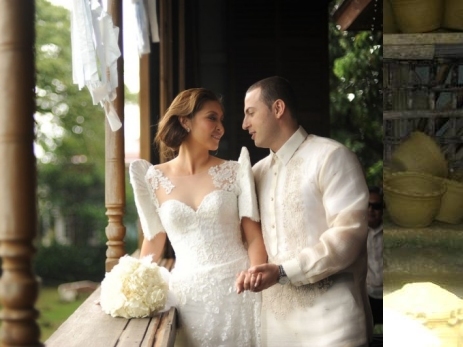 But the owners, an American/Filipino couple had no idea of hotel management. The rooms were really nice and from the balcony of your room you 'owned' the kilometers long sandy beach. It seems to have vanished. Or there had been the 'Sampaguita' in Kalibo. It still exists, but friends reported that it is now only a shadow of the former glory. The nice 'San Bernardino Mountain Resort' in the hills south of San Jose de Buenavista isn't anymore. If you know another good hotel or resort on Panay island, please use the form at the end of this page to inform us. Salamat po.